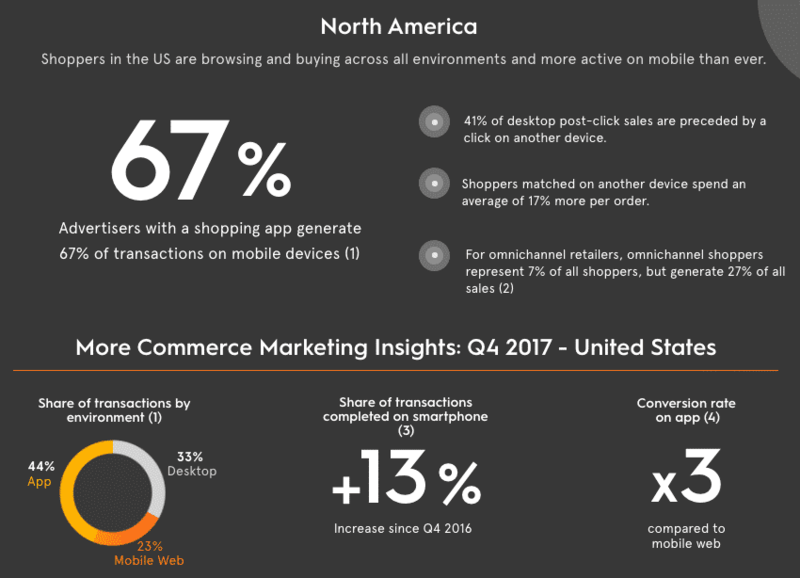 It’s time again for our quarterly Global Commerce Report, where we compile our mobile commerce data from retailers and brands around the world, and the results for Q4 2017 mobile commerce are in! The bottom line: whatever the country, mobile commerce growth keeps increasing. A bigger share of purchases are taking place on phones, especially apps. Here are four key findings from our latest research. Click on our interactive Global Commerce Review Map to see more! 1. Smartphone Commerce Transactions in North America increased 13% YoY. Shoppers in North America remain active on mobile. Advertisers with a shopping app generate 67% of transactions on mobile devices, for retailers who generate sales on both mobile web and in-app. Overall, when compared to Q4 2016, YoY sales increased by 13%. 2. 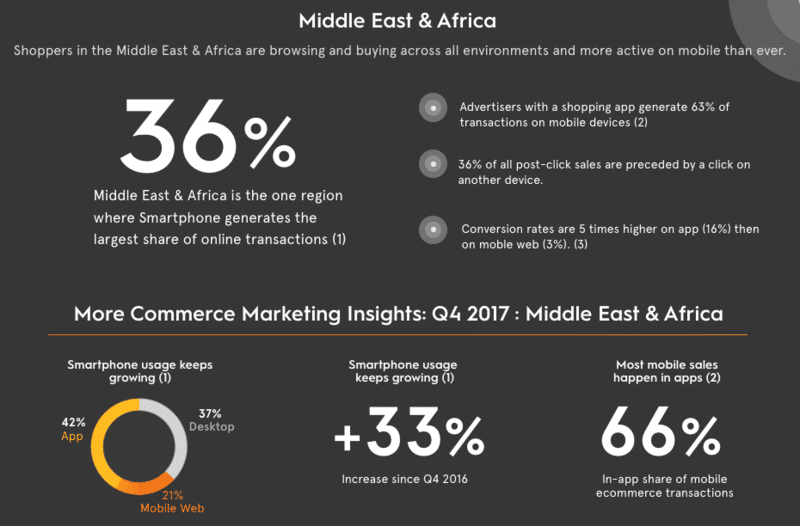 In the Middle East and Africa, Smartphone generates the largest share of online transactions for retailers, excluding apps. The Middle East and Africa may show us the future, where mobile commerce actually dominates retail sales. Only 37% of transactions occurred on desktop. But apps still make for the best conversions as advertisers with a shopping app generate 66% of transactions on mobile devices. 3. Latin America remains the fastest growing region for share of mobile transactions, with a year-over-year increase of 37%. 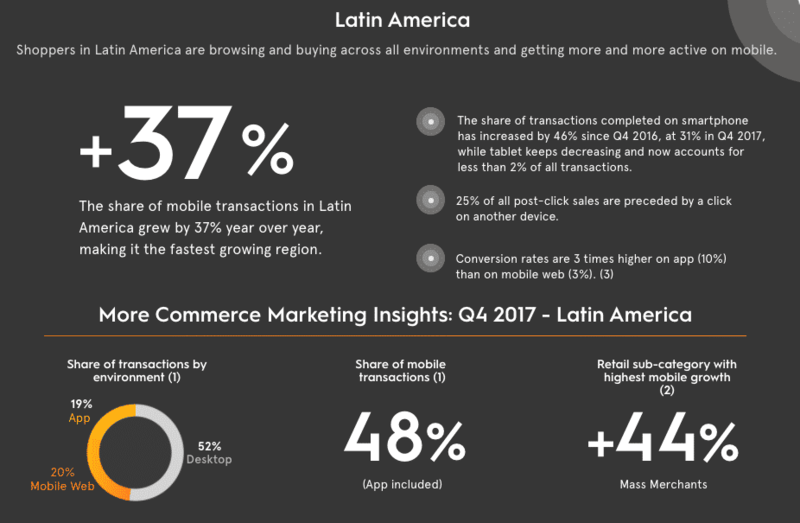 Though tablet usage has decreased to account for just under 2% of all transactions, those in Latin America are savvy app-users, contributing to app conversion rates that are 3 times higher on app than on mobile web. That’s in line with the trends we’ve seen in Latin America in general – there’s been a 37% increase YoY when it comes to mobile transactions. 4. In Europe, transactions on mobile and desktop are split 50-50, with share of transactions completed on smartphones increasing 21% YoY. Retailers with a shopping app now generate 44% of their sales on mobile devices. Interestingly, tablet usage is down like in the rest of the world, but still accounts for more than 10% of transactions. Overall, we still saw strong transactional data on smartphones, which increased 21% when compared to Q4 2016. 5. 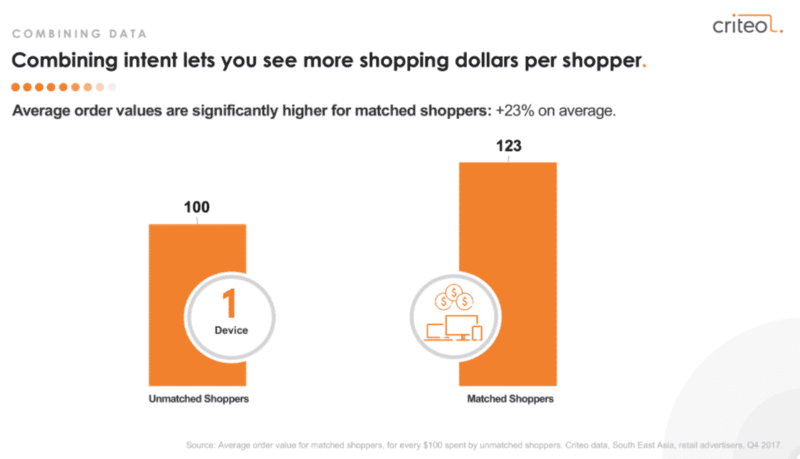 Across the world, shoppers matched on another device spend more per order. We’ve said it before and we’ll say it again: combining intent data lets you see more shopping dollars per shopper, as it provides a better understanding of their shopping journey. In the UK for instance, shoppers matched on another device spend an average of 12% more per order, while in South East Asia, that number is even higher, with cross-device, cross-channels shopper transactions valued at 23% on average. As mobile commerce – and especially in-app transactions – continues to grow, retailers should take note: to stay on top of the growth, it’s imperative to invest in your mobile web and app strategies. One can look to the Middle East and Africa to see that the future could very well be mobile-first, in a big way. With online retail sales likely to pass 1 trillion in 2027 in the U.S. alone, online and offline sales should be evaluated together to paint the whole picture of the shopper journey so marketers can improve campaign efficacy. Criteo’s ongoing Global Commerce Review will shed light on useful cross-device trends that benefit brands and marketers alike and help you identify which you can implement into your future campaigns for immediate and future growth. Download individual country reviews and gain more insights by clicking below!